Based on past racing performance, Danica Patrick isn’t creating any NASCAR buzz for this upcoming 2011 season. However, Miss Patrick has found another way to get racy. GoDaddy.com is known for their provocative commercials—which are always a big hit amongst the Super Bowl audience. And, this year is no exception. GoDaddy features a commercial with personal trainer, Jillian Michaels, and Danica Patrick, in which the two lovely ladies are seen discussing contract stipulations with their agents. Both Danica and Jillian agree that they don’t want to take part in such an over-the-top stunt. While, their agents calmly remind them that not only have they done “racy” ads before, they are both contractually obligated. After the pair reluctantly adheres to the “racy” contract, the two leave a dressing room. The camera pans the floor while a provocative song plays, and we see both ladies’ feet adorned with shiny, silver heels. They continue walking to set as people gawk at them. Then, right as a crew member trips over himself, the commercial ends…and viewers are advised to visit GoDaddy.com to see more! What happens when AARP teams up with NASCAR? The Drive to End Hunger. The campign includes volunteer-led food driver, corporate fundraising, local outreach and more. 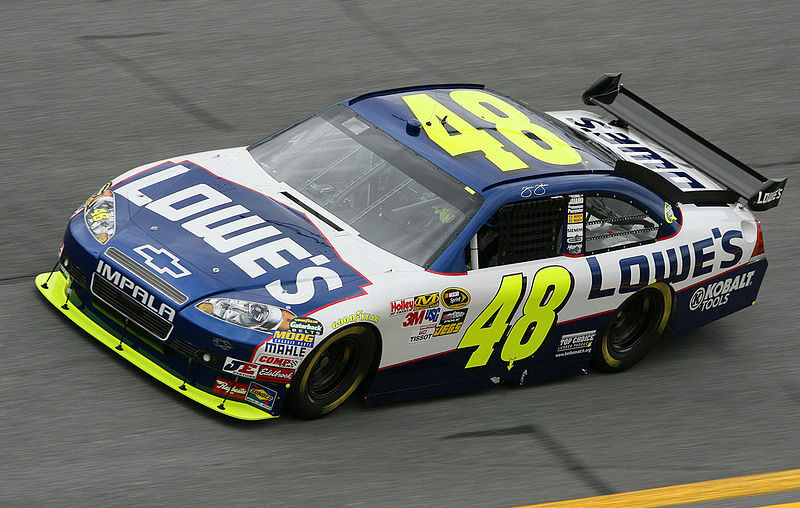 Thanks to Jeff Gordon and Hendrick Motorsports, the No. 24 ride is wrapped in AARP logos to spotlight the fight to solve the problem of hunger in older Americans. The new 3-year campaign began at the West Virginia State Capitol today, Monday, January 10th, 2011 and will continue. AARP challenges people to make a year-long commitment by pledging each month to participate in donating or by volunteering at a local food or soup kitchen. Hall of Famer Junior Johnson has created Junior Johnson Racing (JJR). Why? He’s hoping to use the team to propel his young son, Robert, into the Sprint Cup Series. Junior plans to run this team from shops on his Hamptonville estate—yep, surrounded by animals and all. The new team has names behind it like Keith Barnwel, who will act at the executive vice president and general manager. Robert Johnson is currently scheduled to run the full K&N Pro Series East schedule and also plans to drive in other Late Model events. And, in preparation, Johnson hired two veteran mechanics with K&N experience—smart move. Still stuck on the notion that good ol’ St. Nick zooms around the Christmas skies in his sleigh pulled by reindeer? Think again! Santa’s cruisin’ around in a stylish VW Bug with Rudolf in the back. Play this fun holiday game to try and help Santa with all the presents. Friday December 17th marked the 1st annual Victory Junction Wish Upon A Star Holiday Gala in Charlotte, NC.The children and grandchildren of famous NASCAR drivers worked to spread the word to give back to the community. The event was sponsored by Victory Junction & Newman’s Own Foundation. Victory Junction is a camp for chronically ill children and Newman’s Own Foundation is a charitable food company started by Paul Newman. More than 5550 children and family members gathered at the event in attempt to inspire kids during the holiday season.